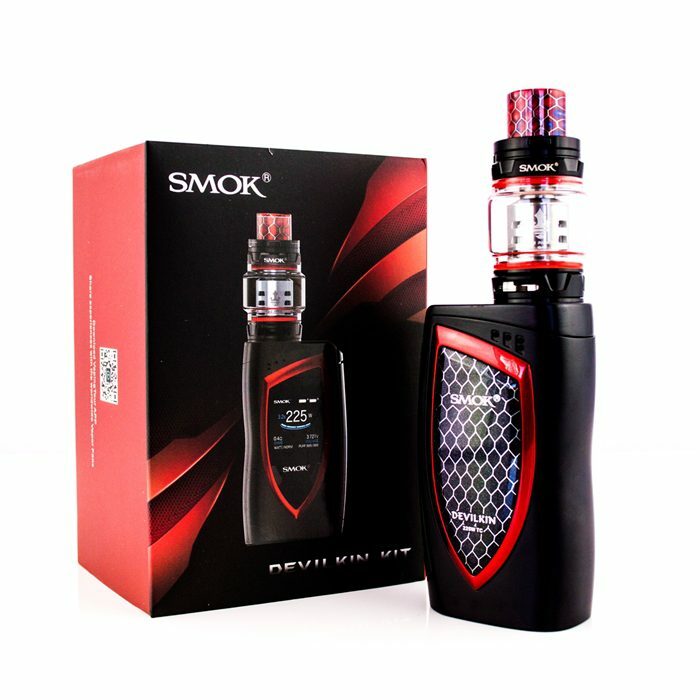 The Devilkin kit is a successor of the Smok procolor, whose release was barely a month ago. For this reason, expect several similarities between the two. However, increased performance is a guarantee with this model. All of the Devilkin Kits come in black although the tank and the trim on the mod may be in one of the following color variants; prism (rainbow), red, chrome, gold, gunmetal, and blue. As far as performance is concerned, the Devilkin Kit is a 225W dual battery mod with a stylish 1.3 inch high-definition display. Its mod measures 86mm tall and 50mm wide with a depth of 34mm. The 1.3 inch screen on this mod is one of its greatest features which enhances its ease of use. This is so because the screen is large enough to display all the relevant information including current wattage, puff timer, voltage, vape mode, puff counter, the resistance of the coil and the dual battery indicator. On top of that, the Devilkin Kit has a 510 connector which perfectly connects the TFV12 tank with the mod. It is rechargeable through the USB port that is placed just underneath the screen. Smok Devilkin Kit performs like a warrior. It has a blade shaped design which looks super elegant. Quality is top notch and features are amazing. I am having a very pleasant vaping experience using this ecig kit. It has a lot of amazing features. It performs without any issue. Overall, I am very happy with my buying decision. Performs great. Quality is also of high standards. A great product in all aspects. Shipping was super quick. Build quality is awesome. It is always a great purchasing experience from Haze Smoke Shop. A great product suggested by them. I am satisfied. A great product for vaping produced by Smok. I always buy authentic products from Haze Smoke Shop. Great Service. Its simple, I purchased it, I used it and and I am loving it. I highly recommend this kit. It performs really good. It is a very durable, reliable and solidly built device. I dropped it a few times, but nothing happened to it. It is much better than the other vape kits available in the market within this price range. Design is very nice. So far so good. Overall, this is a powerful performing product at a great price. Hits good. Charging is quick. Battery life is long. Shipping was super fast. It was very a very easy decision to purchase this product, once I saw the capabilities and qualities of it. So far, the performance of this kit has been consistently optimized. Awesome product. This is a fantastic vape. Its color combination, design and size are amazing.